In the last years, public administration scholars discussed a lot about the (practical) relevance of their research. Does our research make a difference? Does it help to improve government and the life of citizens? What questions should we answer to be relevant? These questions are important if you think of public administration research as an application-oriented discipline – as I do. Like medicine, we do basic research to understand the functioning of public administrations, but we also try to find out things that help in everyday life of public organizations. However, addressing the right questions is only one part of being relevant for public administration practice. The other side of the coin is communicating our results. We do this in many ways. By blogging, by writing summaries for journals directly addressing practitioners, by teaching, by giving training and speeches. Ines Mergel published a good overview of her efforts to communicate her research. Nevertheless, there is a lack of communicating our results, which is the accessibility of our primary work: our journal articles. It is nearly impossible for a practitioner or someone else outside of the academic sphere to read the articles we publish in scholarly journals. Those articles can only be read (legally) if one is a member of an organization that subscribed the journals, we publish in. Normally, these are the universities only. It is indeed possible to pay for a single article. However, the prices are outrageous. I, therefore, think we should do anything we can to make a version of each of our articles available to the public. One option would be to publish in an open access journal. However, the number of solely open access public administration journals is very limited. Besides the newly launched Journal of Behavioral Public Administration (JBPA) and the Journal of Public and Nonprofit Affairs (JPNA), there are no dedicated PA journal I am aware of. 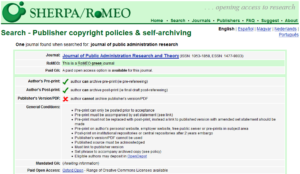 The two existing open access PA journals do not have an impact factor at the moment. However, for most of public administration researchers publishing in such journals is the base of their career because universities and tenure committees require it. As the impact factor is highly dependent on the number of citations in other journals, we can at least support these journals by citing them [Thanks to Bruce D. McDonald, III for bringing this to my attention]. The second option is publishing an article as open access in an established journal for a (quite high) fee. Some universities and grant givers support this and bear the costs of such a green open access publication. Some countries like the Netherlands even made a deal with publishers to allow all researchers in the country to publish open access without additional costs. Other countries like Germany are still in negotiation processes. If someone else bears the costs of green open access publishing, it is easy for researchers to take this chance and make their research accessible. For most researchers, however, it is impossible to finance that on their own. I, therefore, focus on another option here: making the manuscript version of an accepted article available (so-called green open access). What is the accepted manuscript version? it is not typeset in the journal’s style. Are there any restrictions to publish an accepted manuscript? Publishing an article in most journal requires transferring most of the copyright to the publisher. Hence, you cannot do whatever you want with your article. You only retain the rights, the publisher explicitly grants. There are eight publishers of public administration journals with an impact factor above 0.5: Wiley, SAGE, Elsevier, Policy Press, Oxford University Press, Taylor & Francis, Springer, and Cambridge University Press. Sometimes the policies even differ between journals of the same publisher. The safest way to be sure about a journal’s post-print publishing policy is to read the publishers‘ copyright policy. An easier and more accessible overview is given by the SHERPA/RoMEO project. A website that allows you to enter the title or ISSN of a journal to get information about the open access policies of the journal. Below you see a screenshot for JPART. What are the restrictions opposed by the publishers? The final version (as it is typeset by the publisher and published in the journal) can never be published. The manuscript version (as accepted by the journal but typeset by yourself) cannot be published everywhere. Some publishers only allow publishing on researchers‘ website or non-profit repositories (like the Open Science Framework) and forbid publishing on commercial websites like Academia.edu or ResearchGate. There is an embargo period after which the accepted manuscript can be published. For public administration journals, this is normally 12, 18, or 24 months after the article is published in the journals. 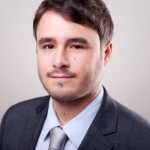 Sometimes the embargo period depends on the way the post-print is published with shorter or no embargo time for the personal website and a longer embargo times for other websites or repositories. DISCLAIMER: I tried to do my best to adequately summaries the journals‘ policies. However, this is not legal advice, and you should check the publishers‘ website to get first-hand information before publishing any post-prints. However, I would like to give a short overview of basic principles. I even made a more detailed list of all journals individually and information about regulations for pre-prints. You can access it here. Where can I publish my accepted manuscript? Contra: Forbidden by many publishers; commercial; permanent? If you asked for my opinion, I would suggest you publish your post-print in one of the non-profit repositories. It guarantees accessibility on a permanent basis, it is automatically indexed by Google Scholar, and it is easy to use. How do I publish my post-print? Prepare a pdf to upload. 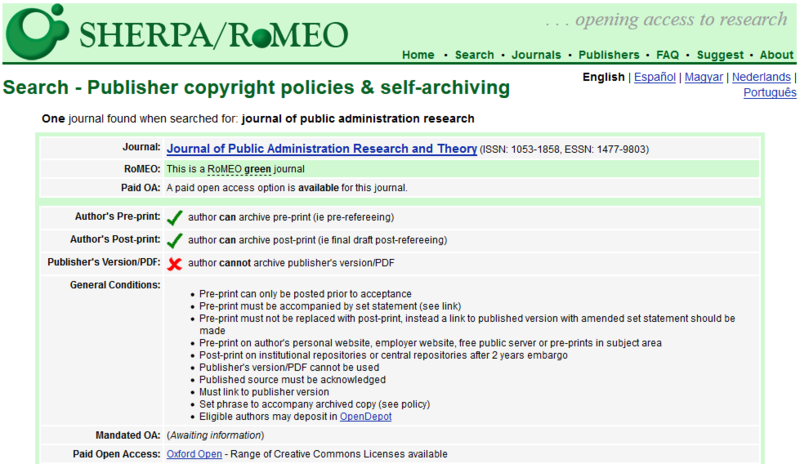 The pdf should contain a link to the version published by the journal and a suggested citation (including the DOI). I encourage you to prepare a version that is nicely formatted, which is the opposite of a regular manuscript (12pt Times New Roman, double paced, 1in margins). Of course. Here is post-print I published on my personal website because the embargo period is not over yet. I also published post-prints at my former universities repository, on Open Science Framework preprints, and SocArXiv. Yes, it requires some work and thoughts to publish a post-print. However, we should invest this effort both because of self-interest and because of ethical concerns. The public has paid for our research, and it, therefore, has a right to benefit from our results, and it should be in our own interest to disseminate our research as broadly as possible. If you have any questions, suggestions or found an error in my tables, please contact me. What about being even more innovative and publishing pre-prints? I think publishing post-prints is not a matter of innovation but a matter of making published work accessible. However, I agree with your argument. If we want to be an open discipline, we need to use pre-prints more often.